I know some people who are awesome at always eating great foods for the body but that’s not me. Life gets in the way sometimes. Preheat oven to 425˚ and grease a baking tray or cover with parchment paper. To make chili, heat a large pot over medium-low heat and add olive oil. Toss in minced onion garlic, pepper, and jalapeño. Cook until onion is soft, 5-6 minutes. While onion cooks, puree half the tomatoes in a blender with the spices to create a sauce-like consistency. Add the pureed tomatoes, remaining diced tomatoes,shredded sweet potatoes, quinoa, and beans (if using) to the pot Bring to a boil, reduce to a simmer, and let cook until ready to serve. Add veggie broth as needed to create the chili consistency you like. To make fries, rinse well under water. 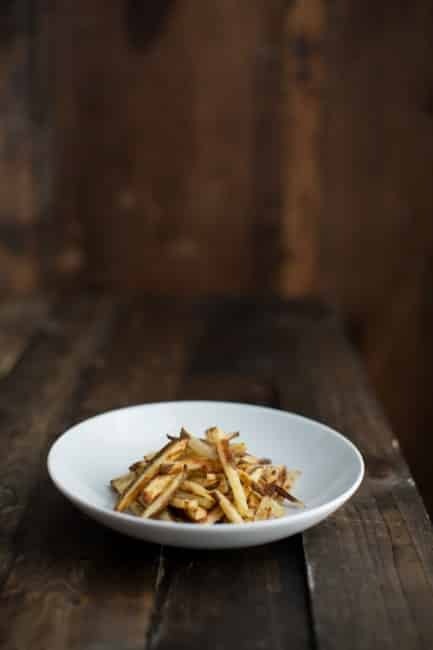 Cut the ends off the potato, stand up on end, and cut slices from the potato that are ¼” thick (depending on how thick you want your fries- cut accordingly) Take slices and cut fries out of the potato-using ¼ ” as the measurement. Once all fries are cut, place in medium bowl and add the remaining ingredients, tossing until every piece is covered. Spread out onto a baking sheet covered in parchment paper. Bake for 25 minutes, flip the fries, and bake for a remaining 10-15 until fries are crispy (35-45 minutes total.) Make sure to not over crowed the pan- this is result in uneven baking. Finally, once fries are almost done, combine cheddar cheese and cornstarch in a small pot. Heat over medium low and stir until cheddar begins to melt. Add 1/4 cup milk, paprika, and garlic powder, stir until mixture comes together. Add more milk, 1-2 tablespoon at a time, to reach a pourable nacho cheese. Assemble fries by pour cheese and chili on top. *I tend to leave the beans out of the chili for the fries but feel free to leave them in! I also leave the consistency of the chili and cheese sauce up to you- I know some people love thick chili and some love a bit thinner. 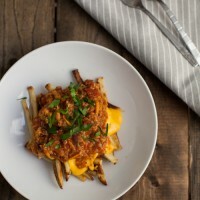 Furthermore, baked fries go soggy a bit quicker when smothered with cheese and chili. Wait until the last minute smother the fries! I remember Michael Pollan saying in one of his books that it’s ok to eat as much junk as you want provided that you cook it yourself. I think your recipe more than fits the bill! Thank you for the link to the cashew cheese. I can’t stand nutritional yeast, but the cashew actually sounds good. Love your open and honest attitude towards food – I feel the same way on many occasions and this is such a useful backpocket recipe when the craving strikes! Yes!! I love that you take comfort food (and dishes that aren’t usually so good for us) and turn them into real, unprocessed versions. These look amazing, Erin! How fun are these? Great idea, lady! Mmmm these look good. This is one of things I miss most from being a vegetarian!!! I think I’ll definitely be trying these out soon! 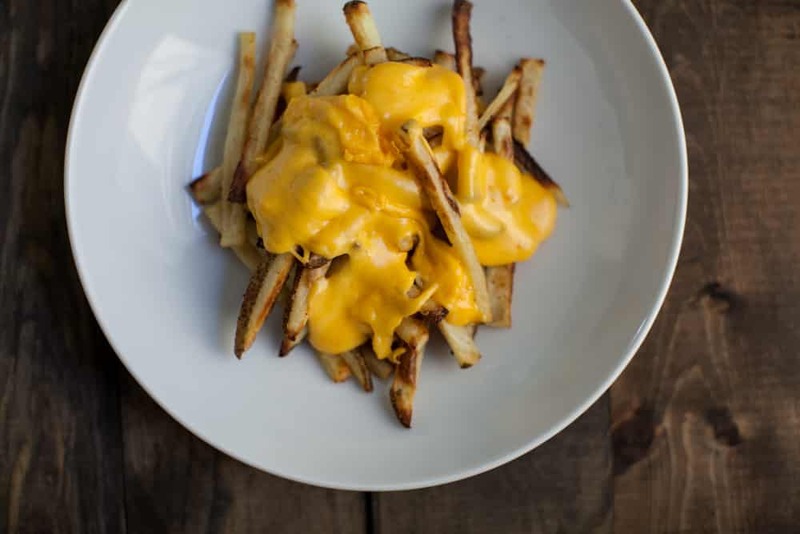 Cheese Fries are up there on my favorite foods of all time so I’m loving this recipe! Thanks for sharing! This is definitely my kind of comfort food. Deliciious! I feel like this is kind of my life motto in fry form. If you can’t fight the cravings…then at least make them better for you! These+football sundays = happening. Mmm, cheesy fries, what a winter delicacy! These are the things I crave when it’s 20 degrees and snowing. These are perfect in so many ways! I would never miss the meat or fried potatoes with these! recipes like this remind me why being a vegetarian is super easy and delicious. These are perfect for a chilly and lazy afternoon on the couch! ha, I can’t believe that’s not a sweet potato! :). 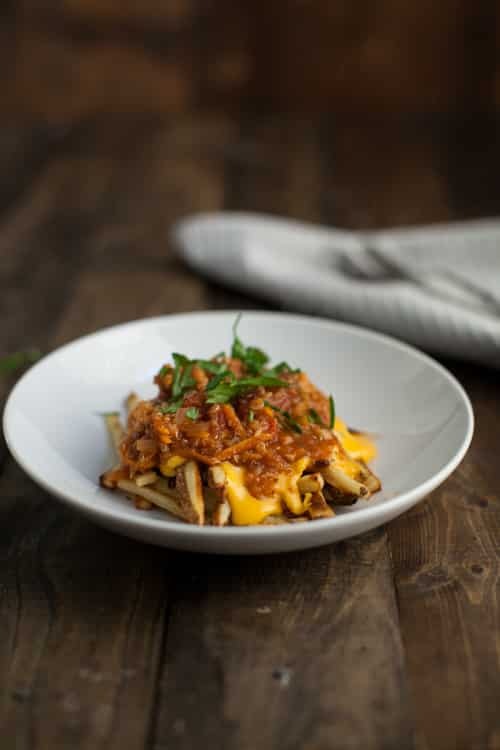 I’m in awe how you just made chili cheese fries look so beautiful… that melty cheese is just gorgeous! 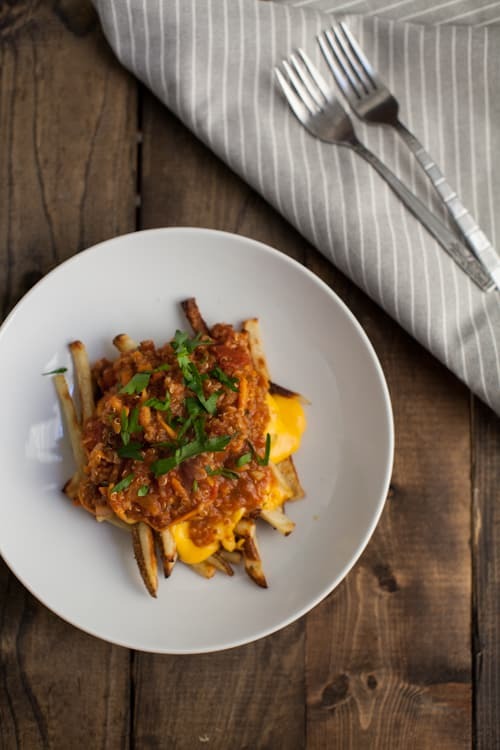 These chili cheese fries look delicious! I totally agree that it’s super important to come up with alternatives to junk food that are healthy, but still satisfy that junk food craving. Thank you for sharing! Chili Cheese Fries. I love the sound of it! Delicious. Hi! I have a question about this recipe… the shredded sweet potato is uncooked right? Thank you! I look forward to trying your chili recipe. I am always looking for that perfect blend of spices for chili, and yours sounds very promising since it does not involve heaps of chili powder. I made the cheese sauce for the second time tonight for Sunday Night Football. i had the chili leftover from the first time and I mixed 1/2 a cup of chili with the cheese sauce (best chili con queso ever) and poured it over home made baked tortilla chips and a side of guac. HEAVEN! Recently went back to being a pescatarian, but I LOOOVE chili cheese fries! Excited to try this out! !